The nutritional content of toddler milk has also given us cause for concern with more sugar but less calcium than cow’s milk. In fact, some toddler milks contain almost twice as much sugar as cow’s milk and for most; their daily recommended doses don’t fulfill the calcium requirements of a toddler. And with 300ml of cow’s milk giving a toddler all the calcium they need each day, costing £62 per year, we think that it would be difficult for parents to justify these costs. Government advice for parents does not suggest that toddler milks are necessary for child’s growth and development. However, nearly half of mothers (46%) we surveyed with a child over the age of one said they feed their children toddler milk. To be honest I’m not surprised. Many of my friends use these milks or have done. When I’ve asked them about why they do, they say they almost use them as an insurance policy – a sort of vitamin and mineral top-up. But it’s an expensive top-up and also one that isn’t as healthy as they might think. The extra sugar in these milks encourages children to prefer sweetened milks, and SMA Toddler milk also contains vanilla flavouring which sweetens it further. Another reason parents may have been swayed to buy these milks is because they are often advertised as promoting that they contain forty times as much iron as cow’s milk and vitamin D.
While there’s no denying that these milks do contain these ingredients the fact of the matter is cow’s milk is not a source of iron and has never been – so should we be relying on toddler milk as a source for the mineral? Children would get iron from the food they eat, including red meat, lentils and pulses and green leafy veg. And while vitamin D can be problematic in the UK (we get it from sunshine which isn’t always in plentiful supply!) the government recommends all children from six months to five years take a multivitamin that contains vitamins A, C and D to ensure they’re getting enough. I think formula manufacturers have been very clever creating toddler milks as they prolong the length of time a parent would use their products from maybe one year (infant formula) to a potential three years and have made toddler milks seem like a natural progression. The government needs to make sure their message that toddler milks are not necessary reaches parents as in this current climate I am sure many families could do with saving the unnecessary money spent on these. 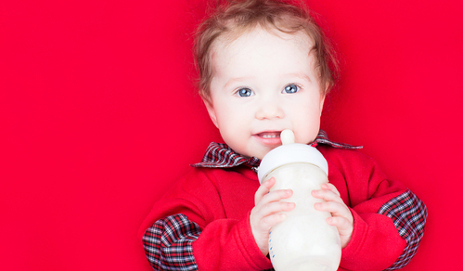 Did you feel obliged to feed your children toddler milk? Have you opted for cow’s milk instead of the formula variety? We’re keen to hear your experiences. I wonder why we expect the government to tell parents what milk to give their children – that really is the nanny state. Perhaps you mean family doctors should advise? Or perhaps, like soft drinks and unhealthy snack foods, parents should be informed through the press and consumer groups the facts and helped to make a sensible choice? These milk companies are marketing their products exactly as other companies do for their products – to persuade you to buy something you probably don’t need. If they make false claims they should be exposed and fined. If they simply set out to suggest their product is beneficial then parents have to decide for themselves whether to spend their money. Like bottled water? Would be nice to see some of the many milk alternatives being included in the debate as well. Some of the statistics in the article I have attached suggest that they contain an even better cross section of vitamins (through fortification) than cows milk, and as they rightly point out, even cow’s milk is fortified with vitamins A and D. The price for soy, rice and nut milks has dropped dramatically in the last couple of years as more and more people are learning that they don’t have to get their milk from sources which are quite so bad for the environment. It is not so bad as Nestle encouraging mothers in Third World countries from using their expensive products rather than more wholesome and often more hygienic breast milk. These products are one more step towards getting us all to take unnecessary supplements. Ensuring that these toddler milks are sweet is ideal for preparing kids for a life of eating junk food. I thought the mother and baby clinics gave free advise on things like this. But they probably dole out free samples of toddler milk and other such products instead. 30 years ago, SMA milk seemed to be the choice of most mothers in my circle, now it seems to be Aptamil. Is there a nutritional difference, there certainly seems to be a price difference. I have noticed out of the corner of my eye that Aptamil and SMA are slogging it out on day-time television right now – it’s an important battle for them, and nobody is putting the case for cow’s milk. Mothers might also be easily persuaded by sugary advertising that their infant needs extra benefits and made to feel that unless they continue feeding formula milk they are not giving their child a proper start. As Wavechange says above, they might actually be doing the exact opposite. I was advised by my Health Visitor that such milks were entirely unnecessary and that I should move my kids onto cow’s milk from the age of 1, which I did. Advice seems varied and inconsistent though. I expect that the power of marketing by large companies is a factor, Ruth. Current advice from the NHS might be the best option. Thank you for this analysis and report. Baby Milk Action has been highlighting for many years that follow-on milks and so-called growing-up milks are unnecessary products. The World Health Organisation issued a new report in July 2013 restating this point. There are additional concerns to the milks being a rip off. First Steps Nutrition Trust has analysed the composition of fortified milks for toddlers and warned that “the voluntary fortification of foods and drinks needs to be questioned as there is increasing evidence that giving additional nutrients to those who do not need them may have adverse consequences”. I had always assumed second stage and follow on formula milks are merely an advertising ploy to get around the ban on promoting 1st stage formula milk and ensuring a brand is kept in the public’s minds. Why anyone would choose to feed their child manufactured powdered milk as opposed to natural cows milk is beyond me!